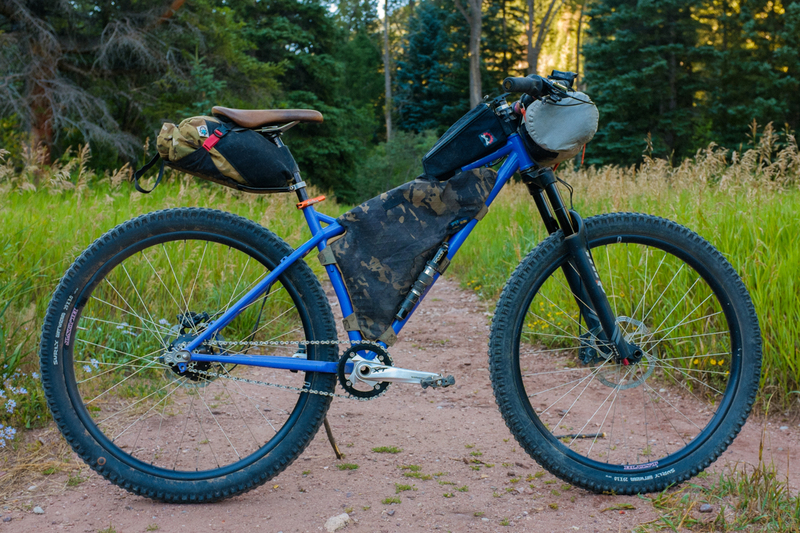 This is the stuff that worked well on the Colorado Trail, and the stuff that I screwed up. 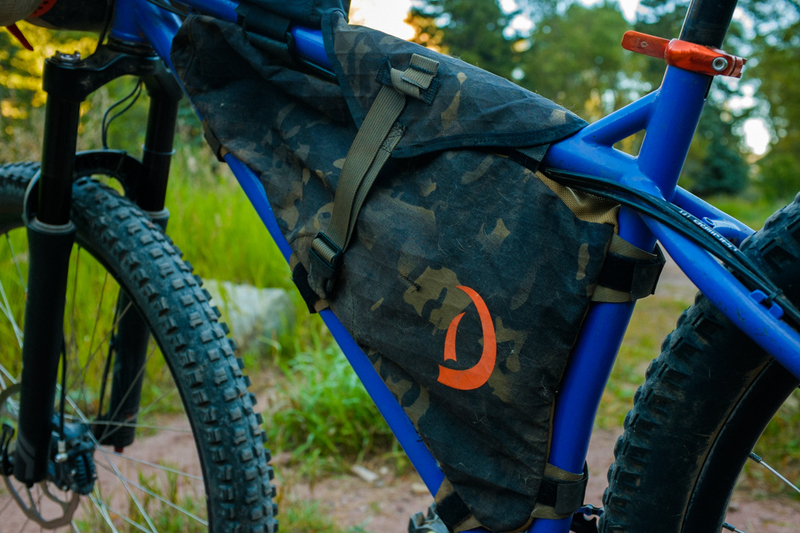 Defiant Zipperless Frame Pack– my friend Heavy Kevy is making these in Carbondale, and they’re better than pancakes for dinner. 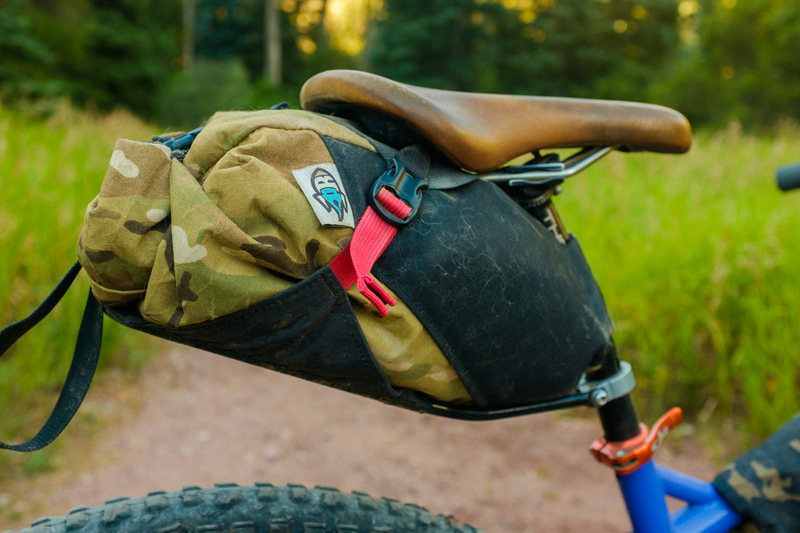 I can open the bag and get into it easily when I’m riding, and when I have to load up on food and water, I just loosen up the strap a little and snap it shut. No more fighting gunked up, overloaded zippers. Not having a sleeping pad- way lighter than taking a sleeping pad. I was so tired at the end of the day that I could have fallen asleep on a slanted pile of pokey rocks and pine cones (and I did). I had a tyvek ground cloth to keep my sleeping bag a little clean and dry. Homegirl Buerkle’s Buerkle Bar Bag- really thoughtful wedding present, and the last piece my setup was missing. The bag fills up the unused space in the Jones bars, and holds all my dynamo wiring, cache battery, and Spot Tracker. I poked some holes in it for the wires. 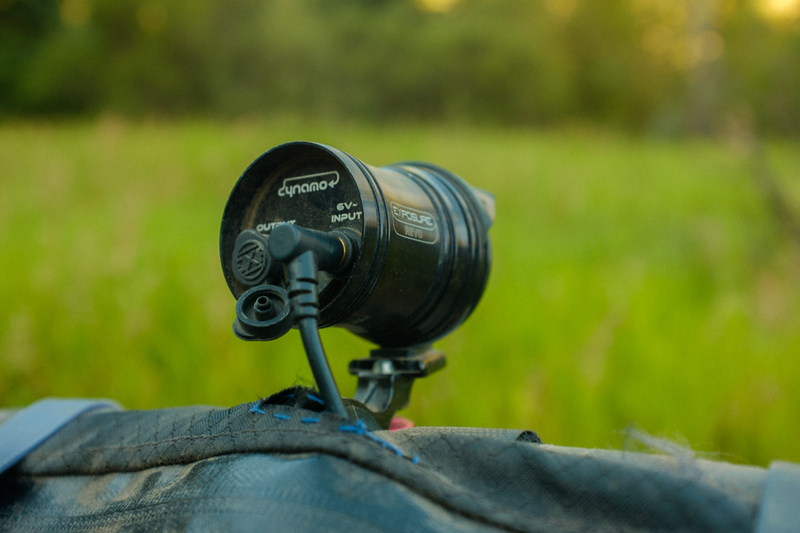 Porcelain Rocket Mr. Fusion– the seatpost mounted support strut keeps this thing really quiet. 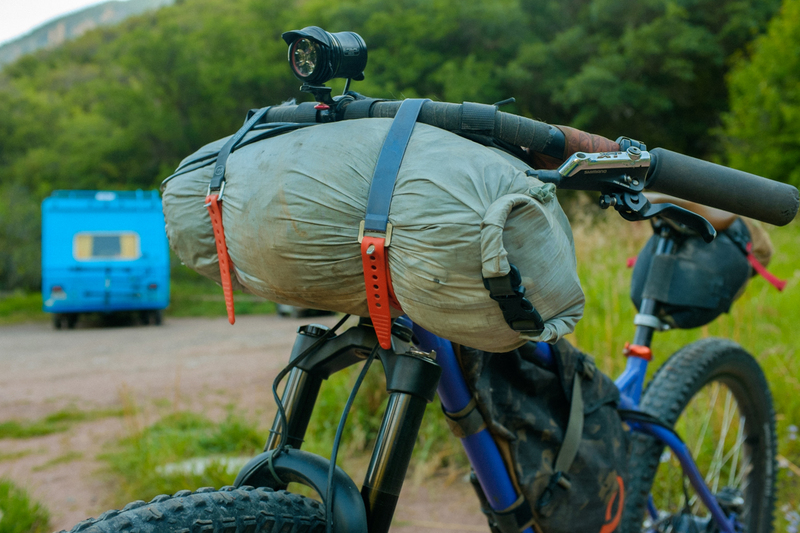 I think all big bikepacking seat bags are going to have to go this way eventually, unless people actually enjoy getting slapped in the thighs and stopping to cinch stuff down a bunch. The Rohloff- it’s expensive (I had to move into a van to afford one) but it works really well. 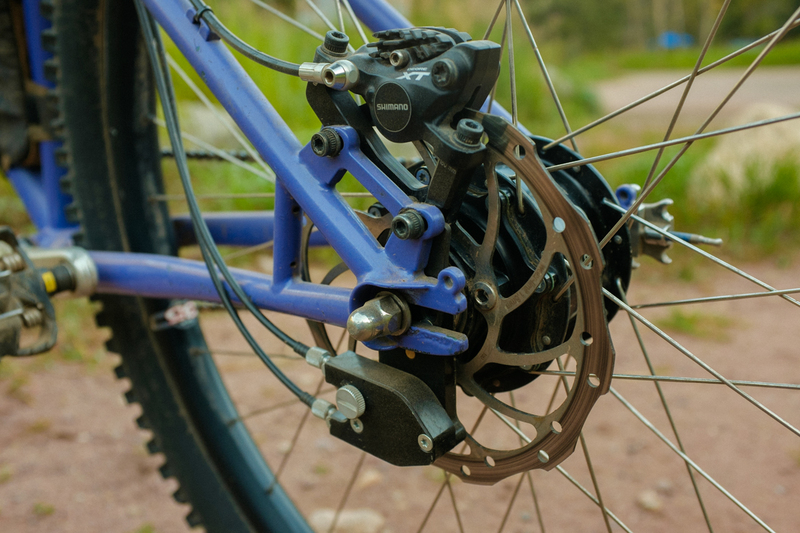 Shifting is a little hard- you have to completely let off the power to get the thing to change gears, but once it’s in gear it feels solid. It’s totally unlike Alfine I have on my Pugsley. That townie hub switches gears pretty fast, but it feels so spongy that there’s no way I can ride it in rocks. I built the Rohloff wheel up three days before I left for Durango, so it took a little getting used to while I was out there. I usually stuck it in a gear that was good for the trail (which was almost always the lowest), and left it alone for a while. It makes some gear meshing noise in the second planetary, although it’s getting quieter now that it’s breaking in. The break in period for these hubs is 1000km, which coincidentally is about the same amount of miles it takes to completely break an XX1 drivetrain. 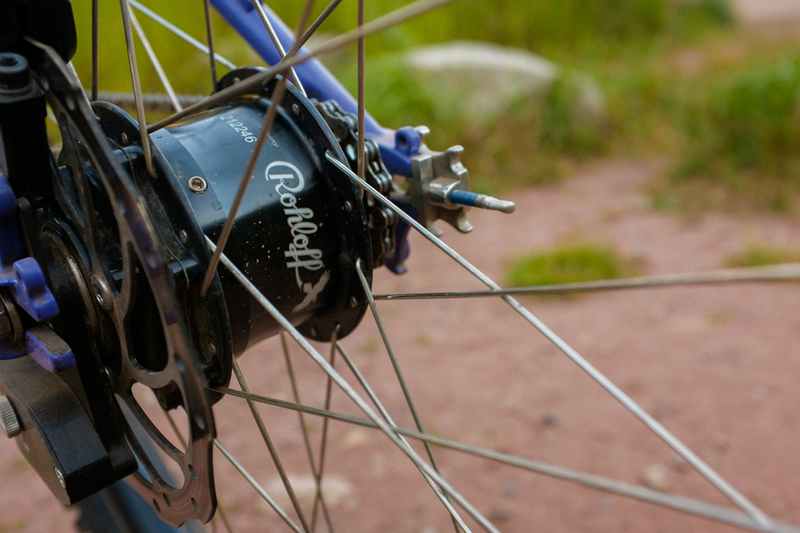 The Rohloff is also heavier than a 1×10 or 1×11. But whatever the downsides, I don’t care- because it doesn’t dangle, slap, snap, and come out of adjustment. It doesn’t make me walk all the time, and it let me ride the road detours faster than 11 miles an hour. Most importantly, the majority of people out there still thought I was riding a single speed, and still thought I was cool. Voile Ski Straps- best thing ever, had no idea these things existed until I moved to ski land. They’re indestructible, and they never ever slip. 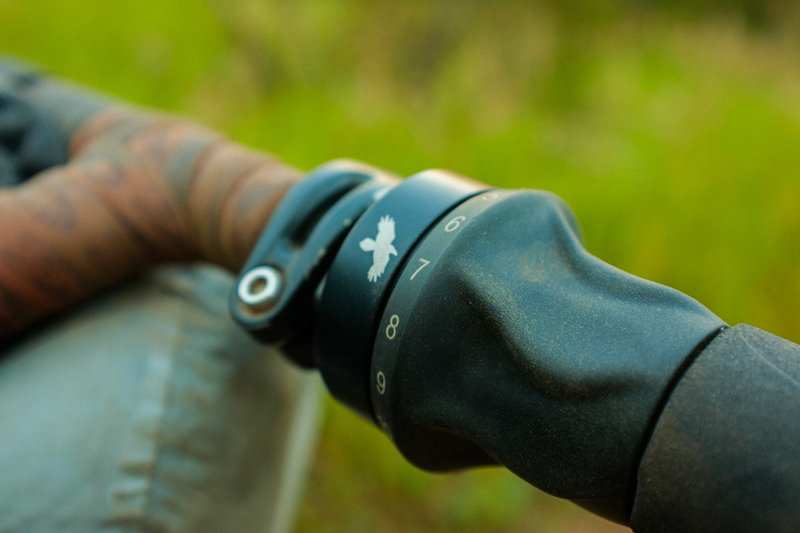 Should definitely be used in more bikepacking gear. Food- I rode almost entirely on peanuts and hot pockets. Slow burning, the coal of foods. Yum. I also filled my top tube bag up with french fries at John’s burger truck in Buena Fiesta. The next couple hours were excellent. 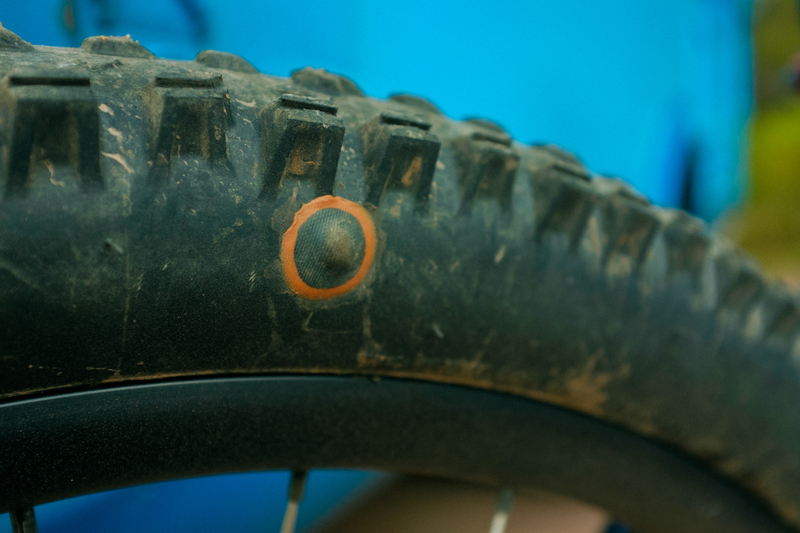 Genuine Innovations Bacon Strips (tire plug nubbins)- I plugged a ripped sidewall with one of those things half way through the trail, covered it with a tube patch, and rode it to the end without a problem. Never had to use a tube. MRP Stage- 140mm travel, rides as good as a Pike, has more tire clearance and external adjustability, and it’s made in America, bruh. Sturdiness- My Krampus weighed 34 pounds without any bags on it. It goes downhill real smooth, and that’s all that matters. 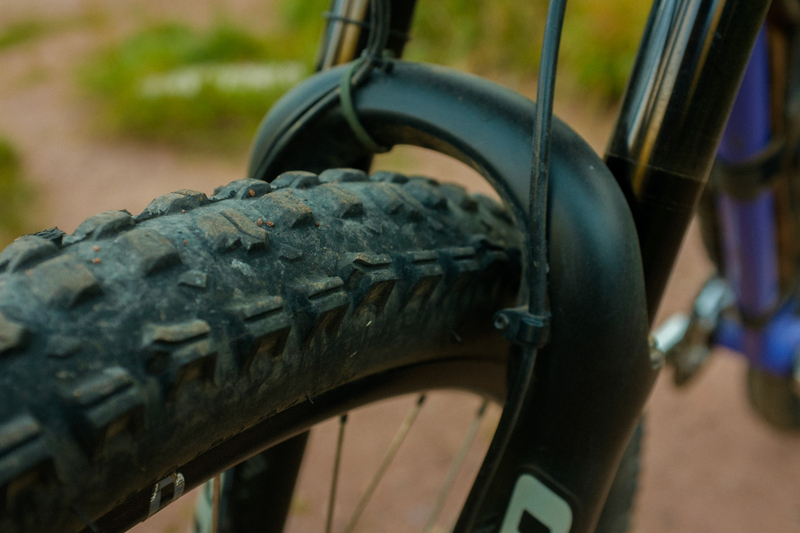 Surly Dirt Wizard 29×3.0- maybe the best trail tire ever made. They have more traction than a cat on a carpet wall. With those tires, the big MRP fork, and all the weight on my bike, on big scary scree filled descents all I had to do was lean back and let it roll. The bike just purred right down the mountain side. And with some XT brakes and 200/180mm rotors, I could still one-finger brake to stop the thing. I’m pretty pleased with how all that stuff worked. My back. Shoulda done some more Arnolds. Or maybe built a lighter bike. Lights- On downhills the dynamo made enough power to get the Exposure Revo on my bars going, and I had plenty of light. 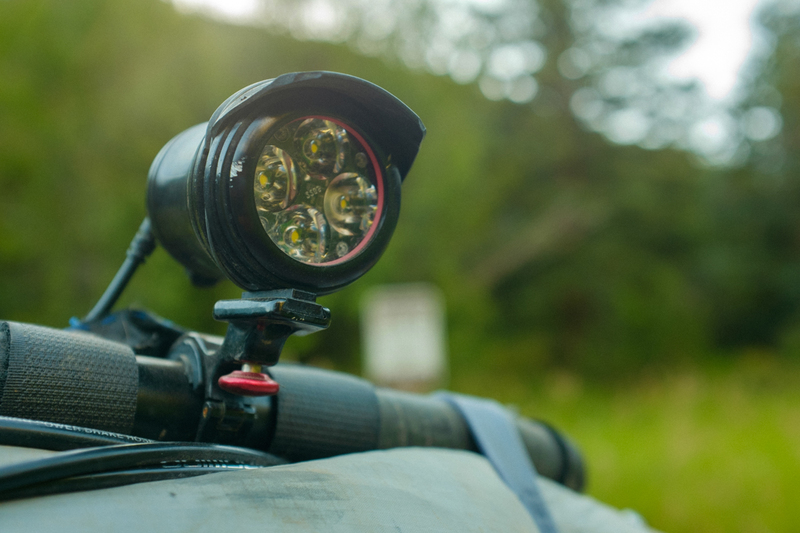 But I was struggling to climb with just the crappy AAA headlamp I zip tied to my helmet. Planning- I didn’t look at the trail at all before I left for Durango, and if Ole Poop Splash wouldn’t have been sick, I wouldn’t have even had the Colorado Trail Data Book (I borrowed his). I think that after my miserable failure on the Arizona Trail this spring when I crashed, later broke a pedal, and had to bail 50 miles in, I was a little reluctant to spend a bunch of time looking at resupplies and elevation profiles. I heard some people saying that it was 200 miles without resupply from Silverton to Buena Vista, and for some reason I assumed that they were rounding up (it just seemed way too far to be true). Fortunately, I’ve never gone on a long ride where I took enough food. That long history of unpreparedness served me well. Working half a day on Saturday, going to bed a little before midnight, and sleeping with a cute dog- that was all dumb. Barely getting an hour and a half of sleep probably cost me half a day, because I was yawning too much to make it to Silverton on the first day. Not understanding how a race clock works- I slept nine hours on the Monarch Crest, because I thought I was a day slower than I actually was, and at that pace, I might as well just do a fast tour. I couldn’t check the race clock, because my phone died on the second day. A quintessential example of an unreliable spectator in Buena Vista told me that 20 racers (it was probably less than 10) had already passed him that day. All that added up to make me think that I was going way slower than I’d hoped to, which made me assume a more leisurely pace than I needed to. But overall, I’m real happy with my first run down that trail. Plenty of room for improvement though. Next time I’ll try to have stuff ironed out a little better. Down to earth. Quite enjoyed it. Hello mate, thanks for the sweet debrief. I’m just wondering what rims you’re running and would you recommend them? I’m thinking of some Velocity Duallys to set my Krampus build up tubeless. Glad to see you dug the Rohloff. I just rode the Trans North Georgia with a 2×10 setup and wished I had plugged in my Rohloff. Glad to see some folks aren’t giving up on 29+ yet.